Earn $8.90 in Rewards credit (890 points) What's This? More than just good looks. SRAM's celebrated Force derailleur has been updated with Red tech, gaining 11-speed compatibility and quieter, more efficient performance. The new Force 22 Rear Derailleur hits these marks thanks in part to SRAM's Exact Actuation™ technology, a design which ensures precise shifting throughout the extended 22 gear range. Next, they set their sights on increasing cassette options, tweaking the B-knuckle design to accommodate larger cassettes. The cage has also received an update for improved chain management, and they've refined the tooth geometry of the jockey wheel, resulting in a chain that runs smoother and quieter than ever before. With all the additional technologies we've managed to keep the weight the same, at well under 200 grams. 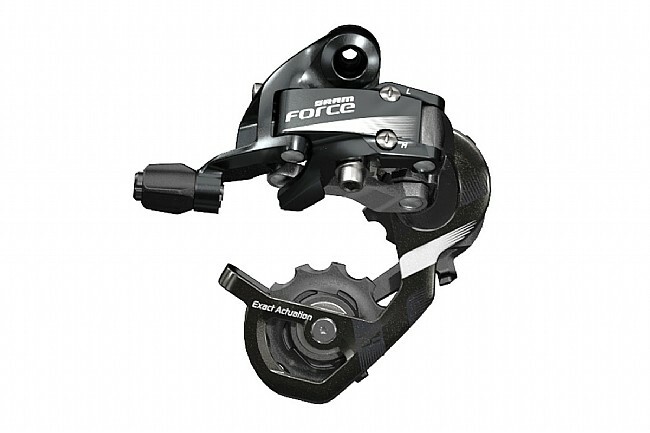 The SRAM Force 22 Rear Derailleur is compatible with SRAM Force 22 and Red 22 drivetrain components. Available in short cage (178g; 28 tooth max sprocket) or medium cage (187g; 32 tooth max sprocket).